Recently we were walking down the Avenue of the Righteous Among Nations at the Yad VeShem Holocaust museum in Jerusalem, when a particular sign caught my eye. The name Charles Coward screamed for my attention. If there ever was a man mis-named, Charles Coward has to be that man. The irony of his name is clear, particularly if you know his story. Coward, a British soldier during WWII, was captured in 1940 near Calais, France. That was his introduction into the inner workings of the Nazi war efforts, and also the opportunity to be a man of courage when and where there were far too few. He is credited with saving as many as 400 Jews, which is amazing. But, the ways in which he undermined the Nazi efforts were brilliant. I would encourage you to read this article about his heroics. 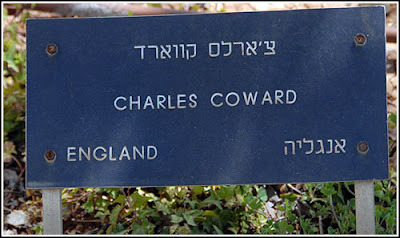 Here’s to men of courage, like Charles Coward, who helped rescue Jews during the holocaust. And the 6 million Jews who were killed shouldn’t be forgotten either.